This Phlox widget?provides you to display your Instagram content directly on your website. Your?latest Instagram photos can appear on any widget area, or even between the content of the posts and pages. Also, some options are available. Such as configuring the number of photos and columns. Recommended: We recommend to add this widget to Subfooter Bar Widget Area. Important: This widget is only for public Instagram accounts. In this section, you are able to add a title to your widget. This field is for your Instagram ID. 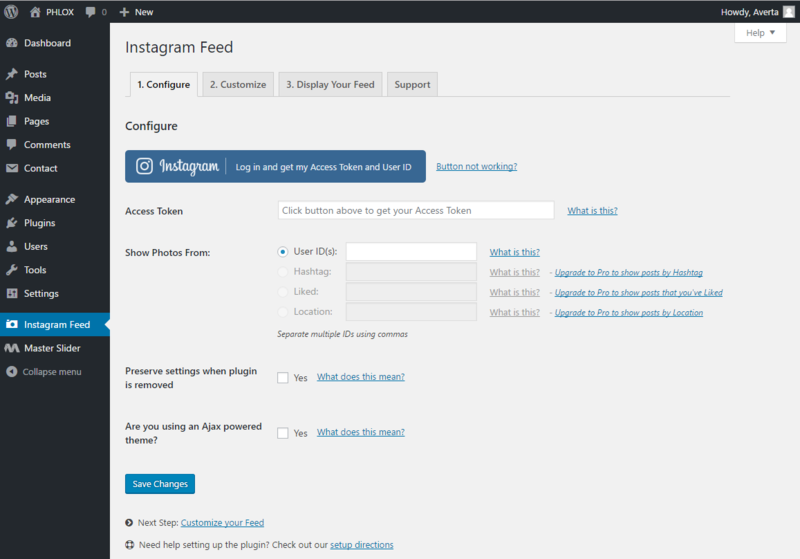 To get your ID,?you can go to WordPress admin panel > Dashboard > Instagram Feed?or visit here. Enter the number of photos you want to display on your website, up to 33 photos. Auto, Thumb, Medium, and Full are three considered sizes for photos. Our recommendation is medium-sized. Here you can set the number of columns 1 to 10. In this field, you are able to add space between photos. The unit of the spacing can be pixels or percentage. The height of Instagram feed is changeable. It can be either in pixels or in percentage. Here choose a solid or transparent?color for the widget background. By enabling this option, you can add a header to Instagram feed. Switch on this option to display a follow button on the feed. By switching on this option, a load more button will be added to Instagram feed. This field allows you to?customize particular content element. Just write the style on your CSS file and define a class name for it, then add the class name here.